As we’ve covered in previous posts, the podcasting trend has skyrocketed in recent years. But who are podcast listeners, how many of them are avid readers, and how can authors reach this key market? 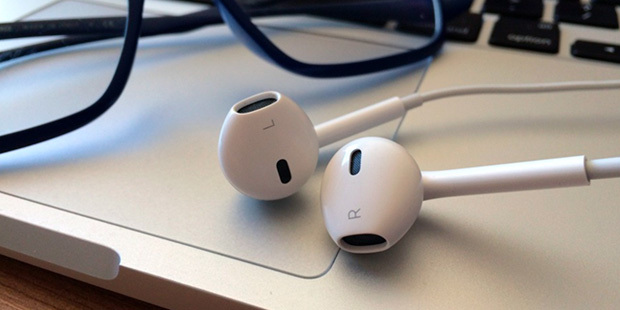 In this article, we compare readers and listeners to find some common ground. According to an Edison Research study, in 2006, just 22 percent of the general American population was familiar with the term “podcasting.” Compare that to 2017, where an estimated 60 percent of Americans (168,000,000 people) are familiar with the term. Podcast listening has clearly increased dramatically since 2013. 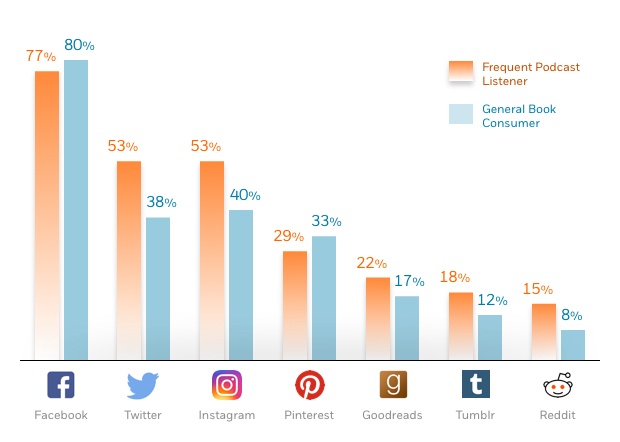 This prompted our consumer insights team to dig a bit deeper into who these listeners are, targeting those most likely to be a part of our book audience. They found that in general, frequent podcast listeners are likely to be multiple device owners who have varied Web interests and are active on social media. 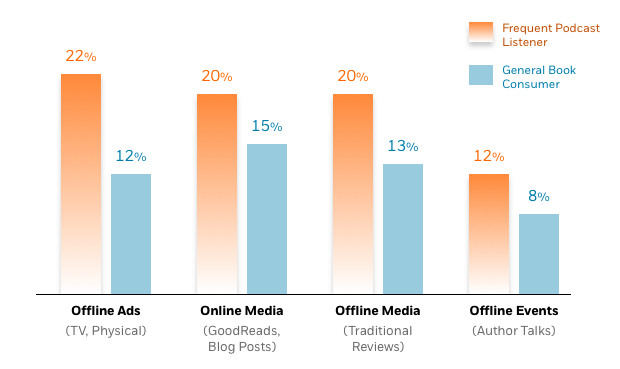 When it comes to social—and traditional—media, podcast listeners are tuned in to venues where your books are often promoted. 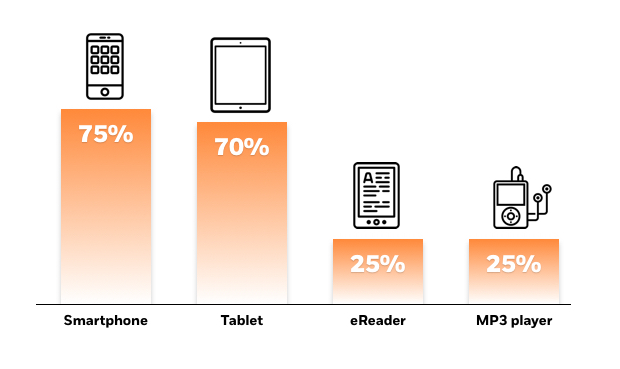 Compared to general book consumers, frequent podcast listeners discover books more often through events and media, and they respond significantly better to offline book advertisements. What can authors do with this information? Podcast listeners are more engaged in the reading community than general readers. This means many of your most engaged current readers, as well as potential future ones, may be frequent podcast listeners. If you aren’t already working with the podcasting community, reach out to your marketing or publicity team to see if they feel podcasts would be a beneficial addition to your mix of marketing activities. Reaching this community can be as simple as becoming a guest on your favorite podcast. Your publicity and marketing teams will be able to give you guidance and discuss the various options with you. While there isn’t one comprehensive authority for researching podcasts, you can use a number of tools to get started. Begin by exploring some of the larger podcast networks or podcast discovery and streaming sites, such as Gimlet Media, Panoply and iHeartRadio. You can also sign up for a monthly newsletter (http://analytics.podtrac.com/industry-rankings/) that shares a ranking of top podcasts. 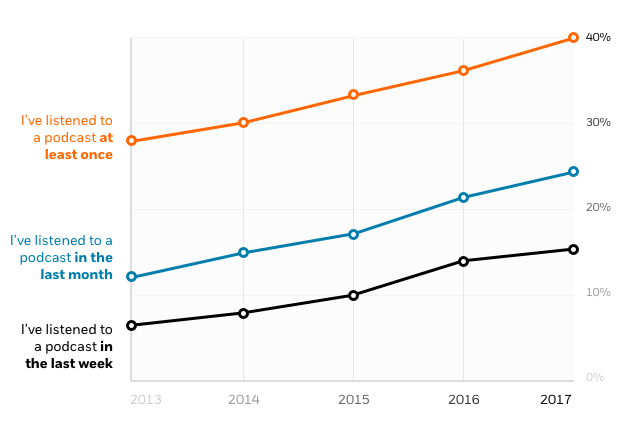 When considering podcasts, it’s worth doing some initial research to find out what size audience they have—the website traffic, online search interest, rankings, and number of reviews a podcast has. Google Trends offers a measure of search interest, which can be compared to other podcasts. 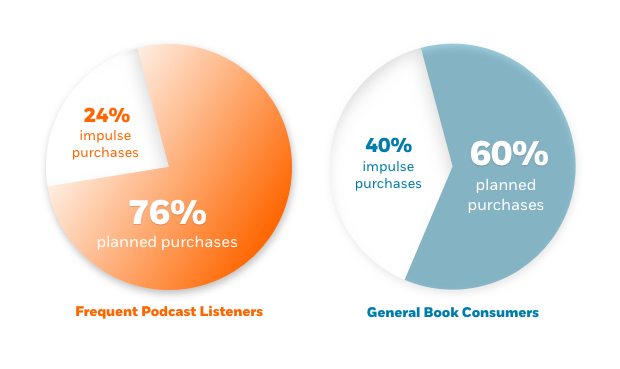 One particularly interesting thing to note from the research is that podcast listeners tend to plan out their book purchases at a significantly higher rate than general readers. Whether they’re purchasing for a gift or for themselves, they appear to be good candidates for pre-order sales. As we explained last month, to build a successful campaign that supports pre-orders, it’s crucial to reach readers who plan out their book purchases. When looking at your marketing plans, you may want to ask your marketer if you should be tapping into the power of podcasters to jumpstart your pre-sales and schedule interviews around this time. As always, reach out to your marketing or publicity team for guidance before scheduling media appearances. Data for frequent podcast listeners and general book consumers was collected from NPD Books and Consumers panel between April 2016 and December 2016. Phillip Stamper-Halpin is Senior Manager, Publishing Development & Author Platforms for Penguin Random House. Zemen Kidane is Consumer Insights Analyst for Penguin Random House.